And this had nothing to do with the team's narrow win against Gibraltar. 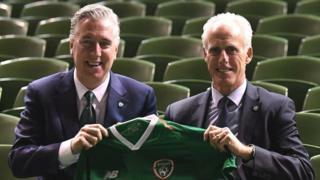 An hour after the final whistle, the Football Association of Ireland (FAI) announced the resignation of its chief executive. John Delaney left his post after 14 years. Instead, Mr Delaney will be moved to the position of executive vice president. More than a week ago, Mr Delaney came under pressure when it was revealed that he had provided a €100,000 (£85,000) cheque in April 2017 to the FAI, which did not appear in its audited accounts. Mr Delaney, a former vice president of the Olympic Council of Ireland, said he had loaned his employers the money "to aid a very short-term cash flow issue". The FAI and John Delaney had unsuccessfully sought a last minute High Court injunction to prevent the Sunday Times from revealing the story. As the association receives a lot of tax payers' money, politicians, including Taoiseach (Irish Prime Minister) Leo Varadkar, are saying the FAI needs to answer questions. While it is not uncommon for a chief executive to get loans from a company, it is much rarer for them to lend money to their companies - or in this case Mr Delaney's association. Judge Anthony Barr ruled that the payment was a matter of public interest. This then prompted additional investigations by Irish newspapers in to other aspects of Mr Delaney's financial arrangements with the FAI. People wanted to know how bad the FAI's finances were, why was there such a loan, why was such an attempt to prevent the story coming out and who would pay the legal costs, estimated at €50,000, for the unsuccessful injunction? Now there are more questions after the news that Mr Delaney is to take up his new job after further Sunday Times revelations that the FAI had been paying €3,000 a month in rent for his house. As chief executive, Mr Delaney's salary was €360,000, having once been as high as €450,000. What salary will he be on in his new role? And how much overlap will there be between his new job and the job of chief executive? There have been calls on Mr Delaney to resign. Fine Gael TD Noel Rock accused him of getting a Rolls Royce salary but not delivering Rolls Royce performances on the field. But this and all the other related issues will be explored next month when he and senior FAI officials are due to appear at the Oireachtas (parliamentary) Committee on Transport, Tourism and Sport.